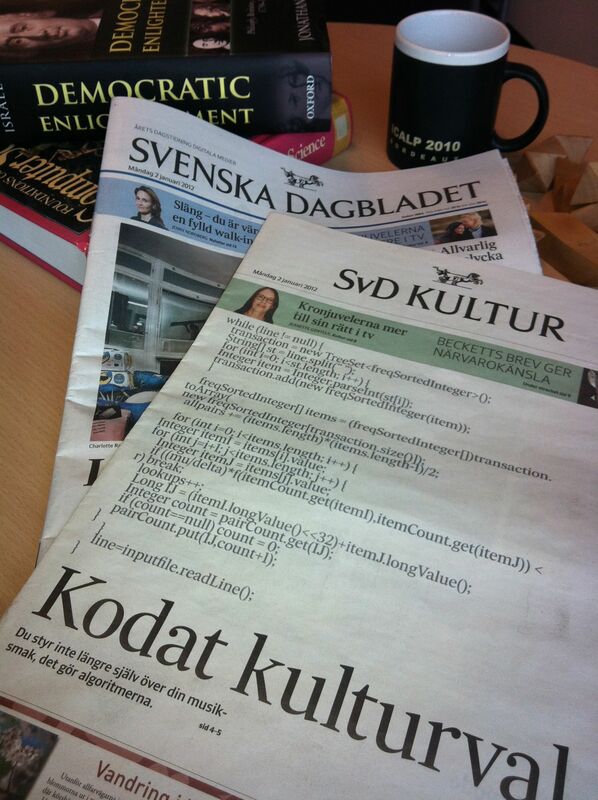 “Coded cultural choice” on the cover of SvD’s Arts section, illustrated by badly indented Java code. My quixotic attempts to insert computer science into the memetic space of the literati continue to bear fruit. Today’s score is 3 pages in Sweden’s major newspaper Svenska Dagbladet. Of course, this only works on a day where the entire cultural elite is still hung over from actually having a life at New Years’s Eve, so there is a narrow window of opportunity where no other culture is being produced. The article is about the effect of algorithms on the consumption of culture. One of the arguments that I’ve been trying to make for a while is that (a) the human condition is increasingly determined by access to information (b) the main force affecting information is algorithms. Thus algorithms are a worth understanding for other reasons than (a) intellectual curiosity or (b) technological progress. The web version of the article is online at svd.se. Such an article are the result of an interview that takes over an hour, and where I say a lot of things about a lot of things, and some subsequent emails. What ends up in the final article is a bit of hit and miss. This time, I’m pretty happy with the outcome. The article contains a nice-looking attempt at actually Explaining What’s Going On. You can see some pseudocode in the web version, where nice-looking brand icons serve as objects that are polled for various signals about previous user behaviour. There is even a collaborative filtering aspect (since the hypothetical Facebook object is queried about what your friends like). Given the constraints under which such a page is produced, I think this came out well. The real point is of course that this code is not written by a human, but by another algorithm, so “the algorithm” performs at a meta-level. I did not find a good way to communicate that, so I didn’t try. Lest somebody misattributes pithy quotations to quotable me, the phrase “program or be programmed” is from Douglas Rushkoff. This entry was posted in Exposition on January 2, 2012 by thorehusfeldt.